Having moved all of the many parts to Crewe, a start was finally made on the complex task of putting the box back together again in May 1991, and the structure was complete and weatherproofed by the end of that year.. 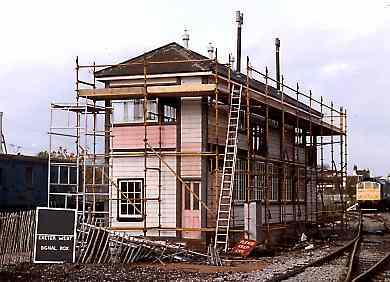 The shell box is seen here nearing completion, but there was a lot more to do before it could be viewed by the public. Inside the box, the 131-lever frame is rebuilt lever by lever, and the interlocking painstakingly reinstated, and was completed during August 1992. 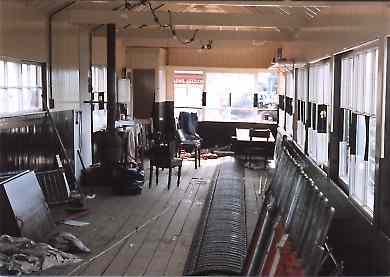 Still to be fitted in this view, too, was the instrument shelf and the signalling equipment. Polished lino on the floor was a long way ahead at this time. The box was formally opened to the public on May Day Monday 1993.